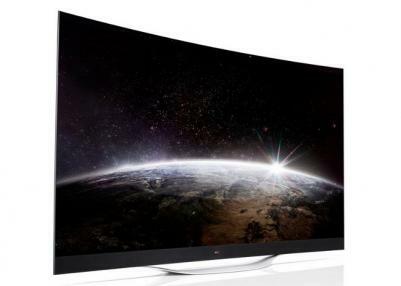 LG's 77EC9800 (in Korea it is 77EG9700) is a 77" curved UHD (4K, 3840x2160) OLED TV. 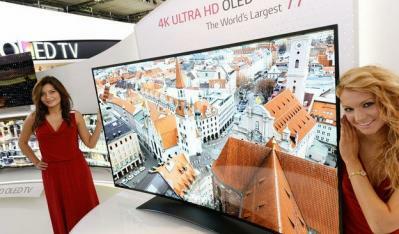 This TV was first unveiled at the IFA 2013 exhibition. Features include LG's Color Refiner that results in superior color consistency and balance, High Dynamic Range (HDR), passive 3D FPR, LG's Tru-ULTRA HD Engine Pro that can upscale resolutions from SD to 4K and Motion Estimation Motion Compensation (MEMC). The TV also includes LG's newest Smart-TV platform. The 77EC9800 can decode broadcast signals in both H.264 and HEVC H.265 formats, at 30p or 60p. A built-in decoder can be used to display Ultra HD content from external devices connected via the TV's HDMI, USB or LAN ports. The 77EC9800 is shipping now for $24,999.